What's up with the color of my Teak Lumber? - St Angelo Hardwoods, Inc.St Angelo Hardwoods, Inc. 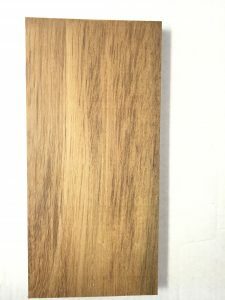 Suppliers of teak are often asked to explain the wide variations of coloring in teak lumber, flooring and decking usually right after it has been freshly machined. Customers have come to expect the familiar golden-brown shade that teak joinery and flooring acquire after long periods of exposure to natural light. People are frequently surprised by blotching, streaking and other color variations in newly machined teak, even though it has been thoroughly seasoned and kiln-dried. After a short exposure to light and air teak tones down to the customary golden-brown color for which it is famous. The transformation is virtually complete after three months. “Tectona grandis”, (true teak) grows in relatively large areas of Asia. It can also vary slightly in color due to differences in locality, soil and climate. Over the years, color variations have become more prevalent for reasons we do not understand completely. Rest assured that the color will return to golden-brown as usual.